Saturday, July 18, was the second day of the Con, and it was better, for me, than the first, but I didn’t take as many pix. Sorry about that . . . Early Saturday morning, I am ready to start playing some Tunnels and Trolls. 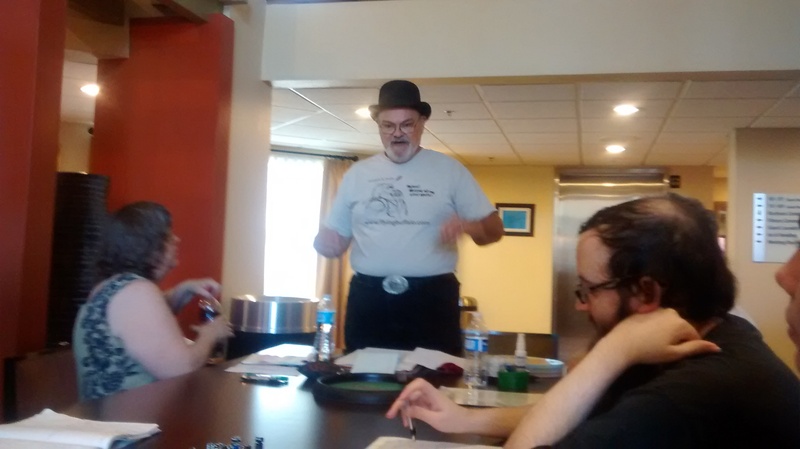 Our Game Master is the jovial James “Bear” Peters, who informed us that he was awake at 4 in the morning making a new dungeon for us. The place turned out to be a ruined tower that had been turned into a harpy nest. We had about 7 adventurers in the party, and though we didn’t completely clean the place out, or run into the big bad, we slew a lot of harpies, found enough loot to make the trip worthwhile, and got away with our lives, no one being even seriously injured. In my role as a wandering warrior adventurer, I count that as a major success. 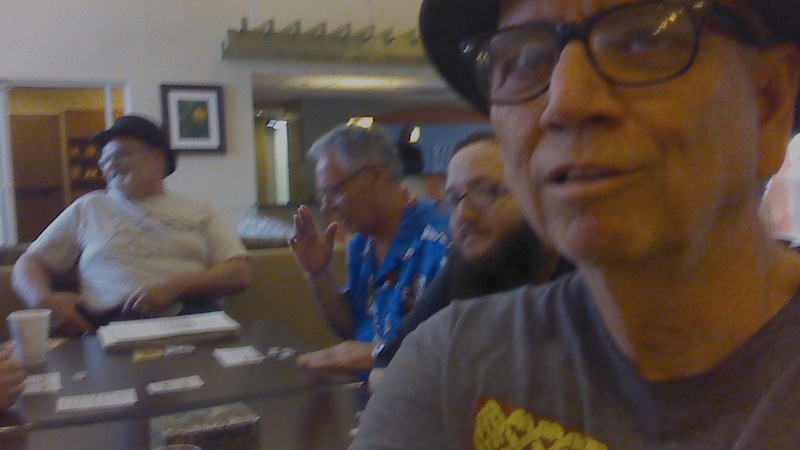 This picture show me closest to the camera, then my son James St. Andre, then Hollywood scriptwriter Larry DiTillio in the blue shirt, and at the far end of the table, James Peters. 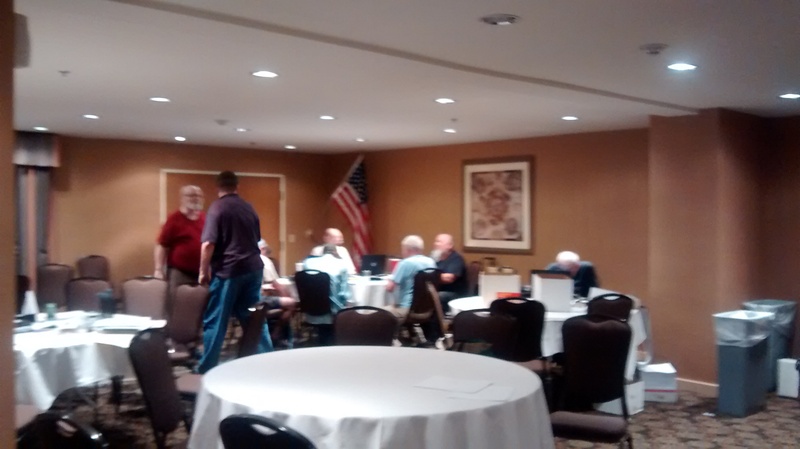 The setting is the largest table in the Days Inn cafe area around 10 a.m. after the breakfast crowd had departed. Same general area much later in the day. It doesn’t look like Bear and Larry have moved at all, but Larry has changed his shirt. At the table off to the right John Lach is running a game for James St. Andre, Mark Thornton, and Kris Miller. Jump back in time, we see Bear explaining something to Laura Samuelsson, one of the players in the first game. James is doing what roleplayers so often have to do–wait until the game action gets back to them again. The waiting part of roleplaying drives me crazy, and is why I would much rather be the G.M. than a player. This is a look at the area where the convention was supposed to take place. But this room is full of very noisy computer gamers who are all playing StarWeb and Heroic Fantasy. Both games are computer moderated, though you cannot see the personal computers set up to handle the task, and another turn is due every half hour. The bald gentleman standing in the back is Rick Loomis. Too noisy in here for us roleplayers, so we took over the cafe. 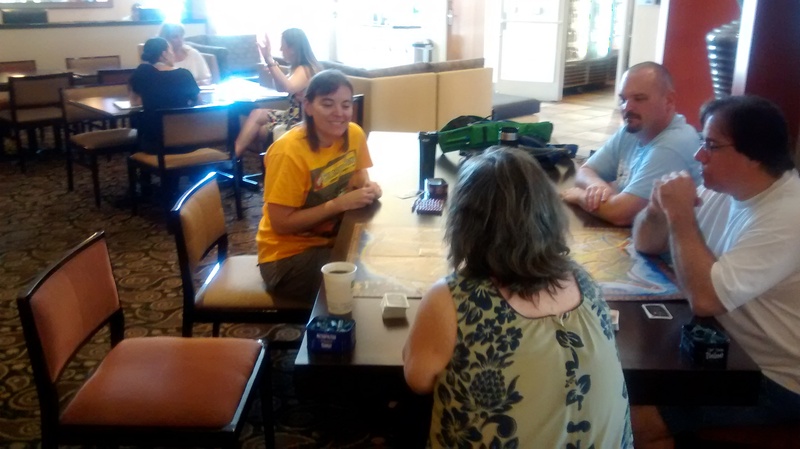 In midafternoon I suggested that Mark and his family leave the convention and come see me at my apartment where I would run a game for them. Everyone was hungry, so we started to go to the new Lolo’s Chicken and Waffle Restaurant that was built in the hotel parking lot last year. The place was incredibly noisy and crowded and we didn’t go there. 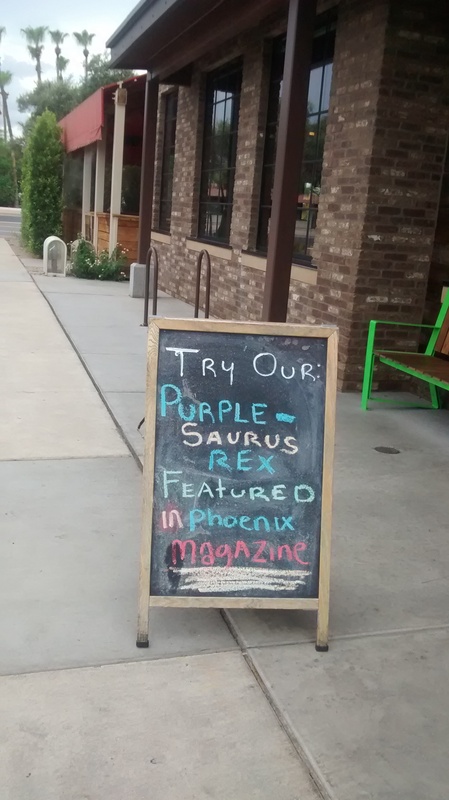 I may never know what Purple Saurus Rex is. 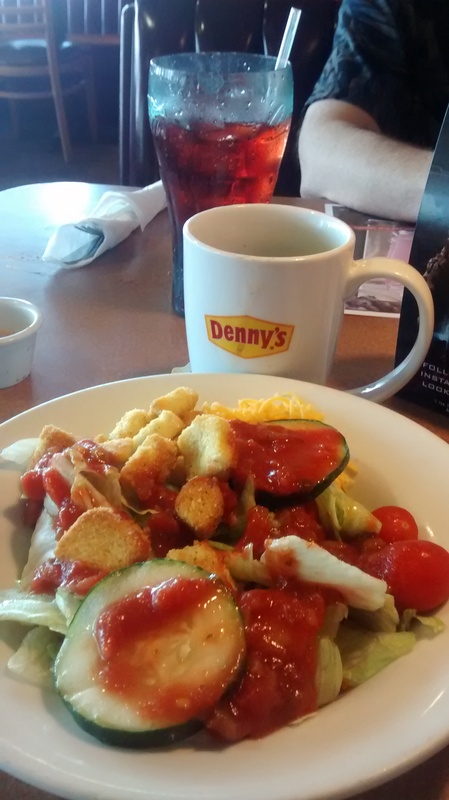 We wound up eating in the Scottsdale Denny’s restaurant 2 blocks to the north instead. You get to see what I had for supper on Saturday. After that we got to my place where we had a most excellent T & T game in a single session that lasted a little less than 4 hours. I don’t think I want to reveal the plot of my adventure, but it took our players from a palace in Khazan to an evil black pyramid in caverns far below the city. 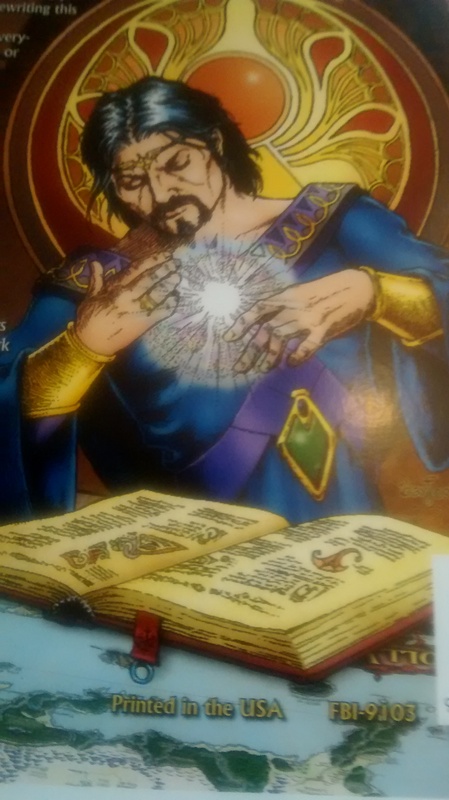 I used a favorite GM technique of planting my own powerful NPC in their party so they would have a chance–just a chance, mind you–to survive and win through situations that were numerically too tough for them. Even so, it took much brilliant role-play on their parts to “win” the scenario, and they were all richly rewarded at the end. Alas, we got no pictures of the action at my house. I will say I was proud to be able to host Mark, Charley, Kavela, and Kamea for a few hours. After all, I spent more than a week at Mark’s place in New Zealand a few years ago. 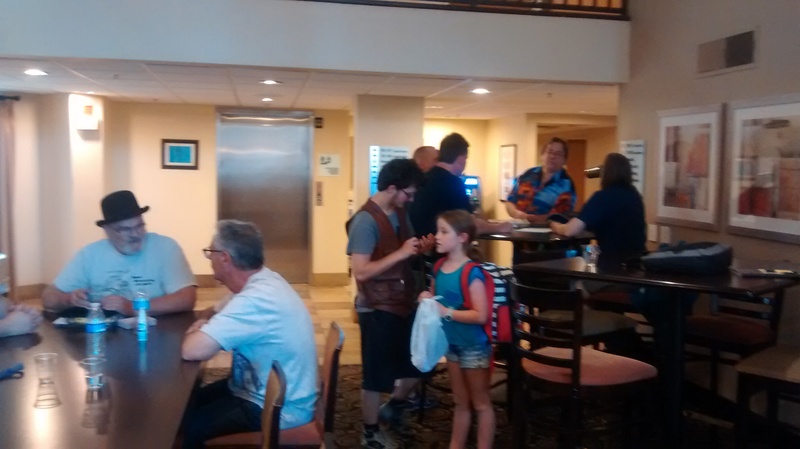 This Con report will be continued in part 3 tomorrow. For the last 20 or 30 years, Flying Buffalo has been holding a mini-convention for its fans here in Scottsdale, Arizona. About 6 years ago some rabid Tunnels & Trolls fans brought up the idea of holding a Tunnels & Trolls gaming convention here. Rick Loomis, owner, president, and CEO of Flying Buffalo simply adapted to the idea, changed the very unofficial name of his mini-con, and suddenly it became TrollCon, at least to me. It’s happening again this year. I was there for most of the day, and I took these pictures. I’m not trying to do an accurate scientific report on what happened at the Con. 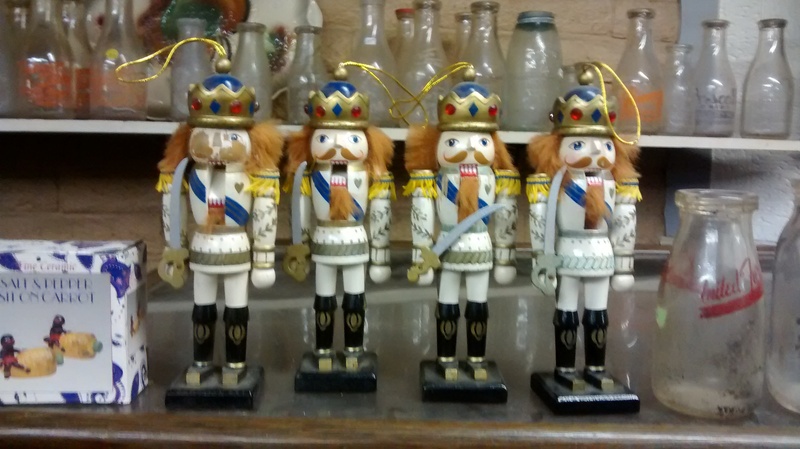 This blog isn’t about accuracy. It’s about what entertains me. And by extension, you might be entertained also. So, I go to cons these days mostly to hang out with friends that I seldom see other times during the year. And that’s what I’m doing here at TrollCon 6. So, no images of me in these pictures–just shots I felt like taking. TrollCon traditionally begins with a poker game on Thursday night before the Con. This year Steve Crompton played host for it. 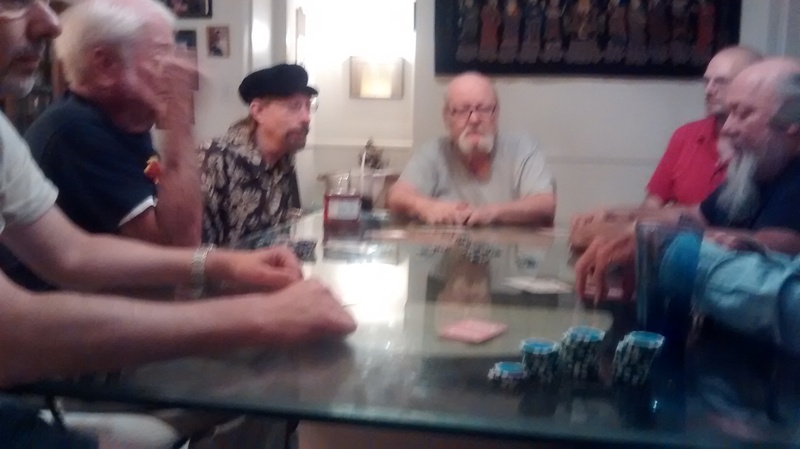 Steve is the man with the black beret sitting next to Rick Loomis at the far end of the table. Rick is the bald, white-bearded guy at the end of the table. I’m sitting at the close end of the table. You can see my chips and my cards, but not me. On to the next day, July 17, 2015. These pictures are in no particular order. Closeup of my friend, Mark Thornton. Mark is an amazing gamer, a writer, a father, and a world traveler. He came all the way from New Zealand to be with us today. That is the farthest anyone has ever traveled to attend a TrollCon, although several people did come from other states. 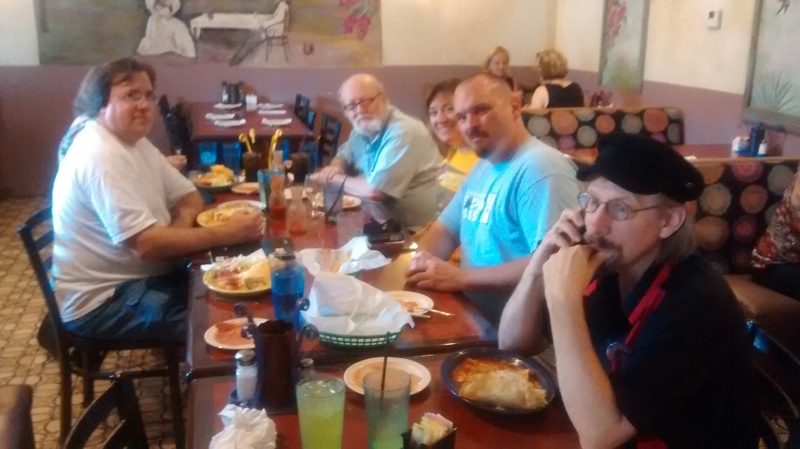 Several of us went to lunch today at a nearby Mexican food restaurant called Los Olivos. 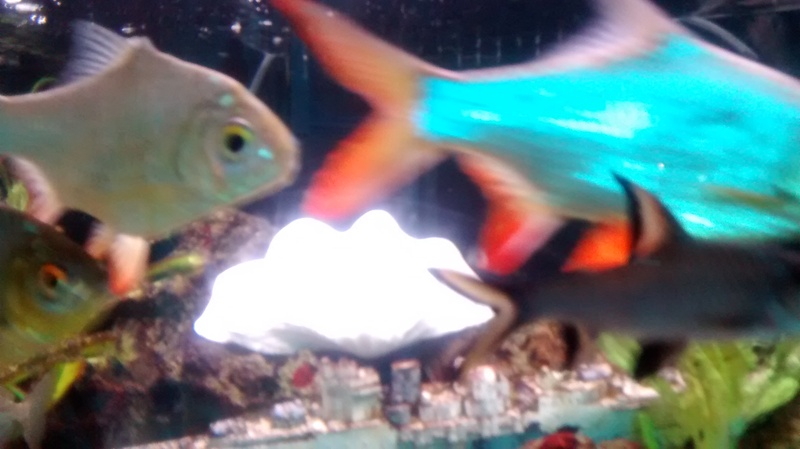 They have a very nice aquarium, and I like aquariums so I snapped a fishy picture. 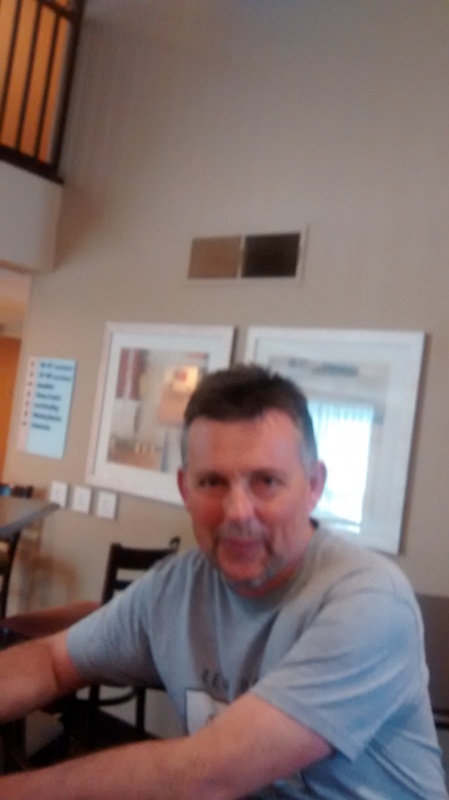 Picture of my friend, Jim “Bear” Peters. 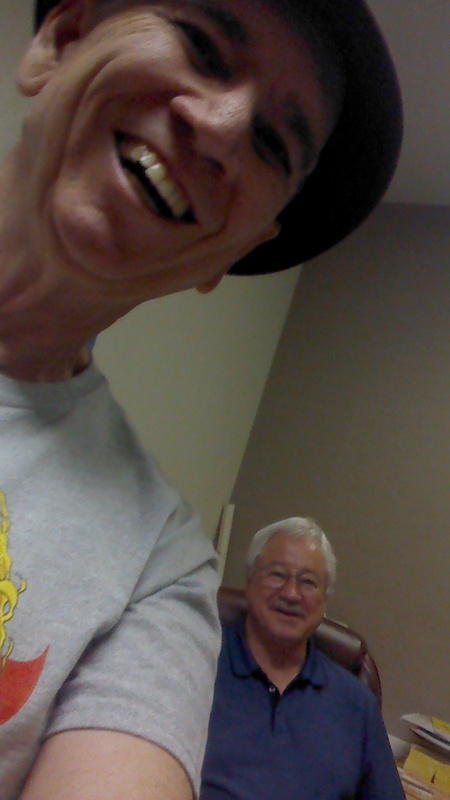 Bear has been playing Tunnels and Trolls with me since game 1 back in 1975. He is part of the Fellowship of the Troll, and contributed material to the Deluxe Tunnels and Trolls rulebook now in preparation. Here we are eating lunch at Los Olivos. Starting with the man in the white shirt, and moving around the table clockwise: John Lach, Laura Samuelsson (Rick’s sister–it was her idea to come here for lunch), Rick Loomis, Lisa Miller, Kris Miller, Steve Crompton. It was tasty and delicious, and 7 hours later I’m still too full to eat anything. 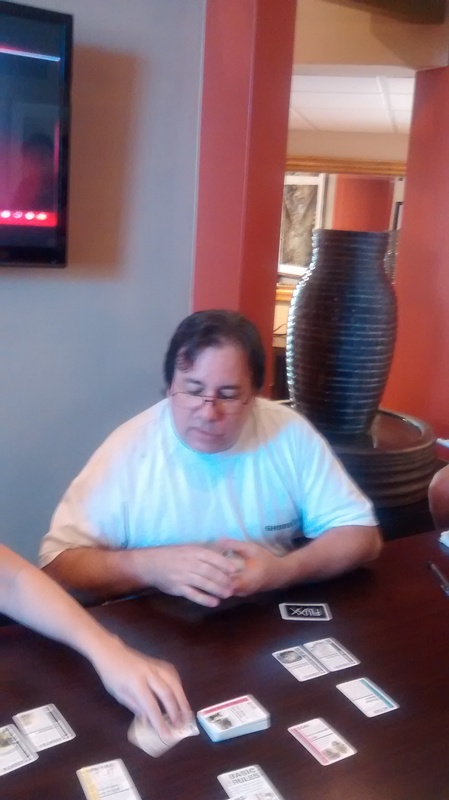 John Lach, a member of Trollhalla, came over from Texas to game with us. Here we are playing Cthulhu Flux. Los Olivos is beautifully decorated inside. You saw the aquarium. 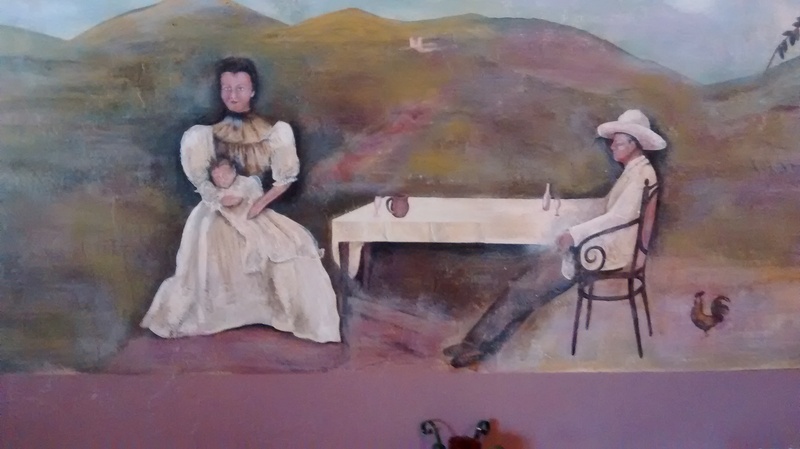 This wall mural was right behind our table. 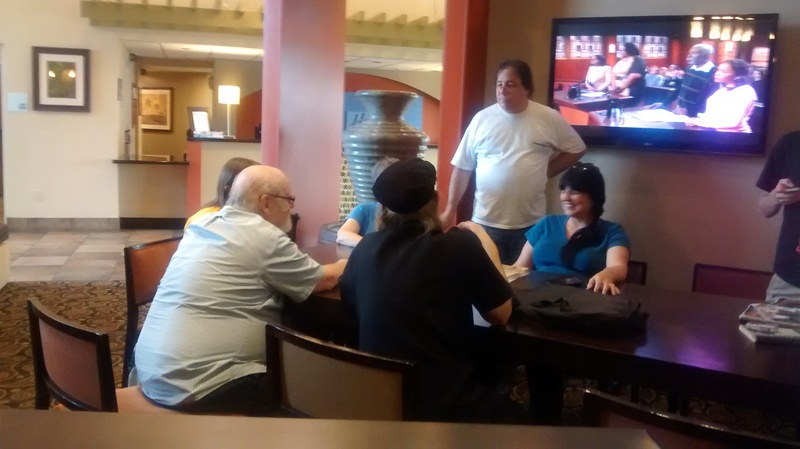 Some of us are hanging out in the hotel lounge/restaurant just talking. 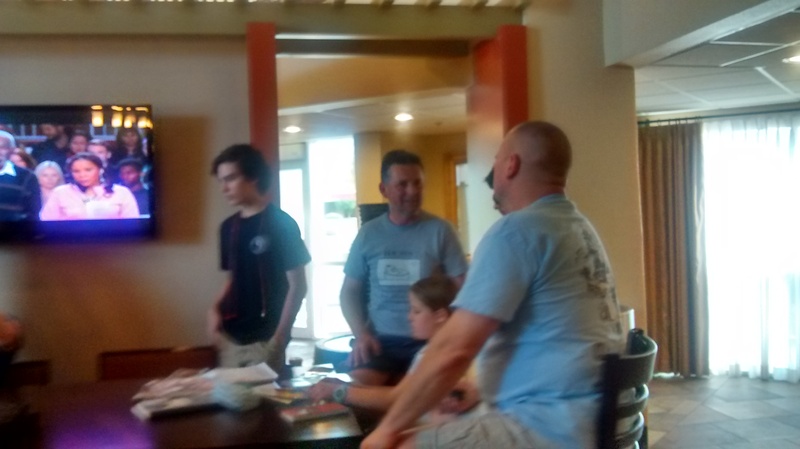 The young man in the black shirt is Kavela (sorry I don’t remember his last name–he is Mark’s nephew), Mark Thornton, his daughter Kamea, and Kris Miller. That’s all the pictures I took today. By about 4:30 p.m. I wasn’t feeling too good, very tired, headache, shmoozed out. I excused myself and went home. TrollCon will resume in the morning, for me, although all these others will probably stay and party together far into the night. If you wish you were at TrollCon, or know any of these participants, why not leave a comment? This morning about 8 a.m. I went back to Complete Print Shop and picked up a proof copy of Deluxe Tunnels and Trolls. It is standard practice for a printer to show the publisher what he intends to print before the presses really start running. This is the last chance to correct any errors before the book actually gets printed. In this case, I’m not the guy who would make or order corrections, but I am the guy who lives closest to the printer, so I get to do the legwork. Around 8:30 I was talking to Dennis Dunn again, and he handed me what looked like a ream of typing paper and a big color wraparound version of the cover. Of course I took some pictures. 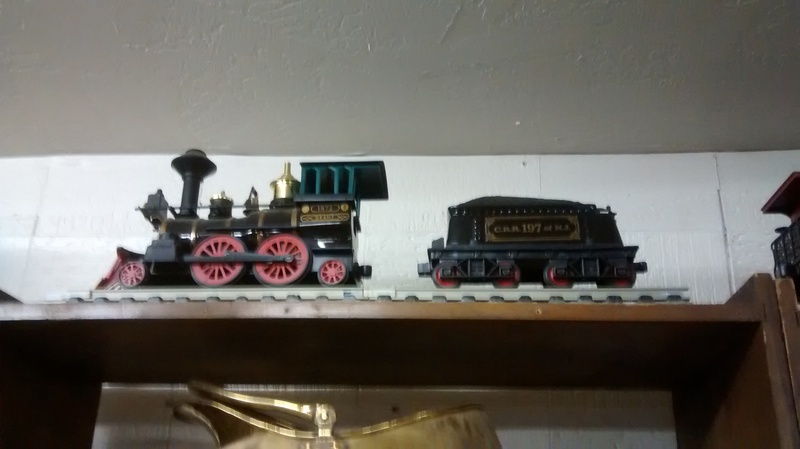 So, I drove 20 miles to Scottsdale and delivered the package to my layout artist/editor/producer Steve Crompton. This is the crucial document right here. 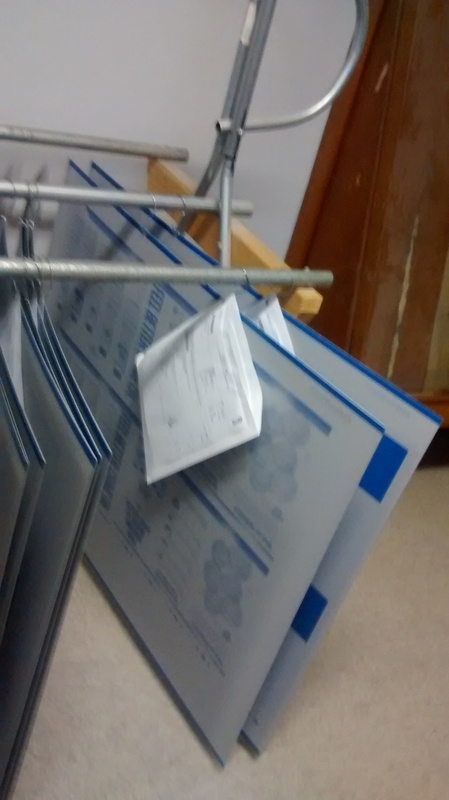 Before they print, we have to check one of these boxes–we’ll go for the second one, as we found at least one problem–and where it says customer signature, Rick Loomis, CEO of Flying Buffalo, Inc. has to sign and authorize the printing. This is the back cover. If you look in the center right at the bottom, you will see: PRINTED IN THE USA. 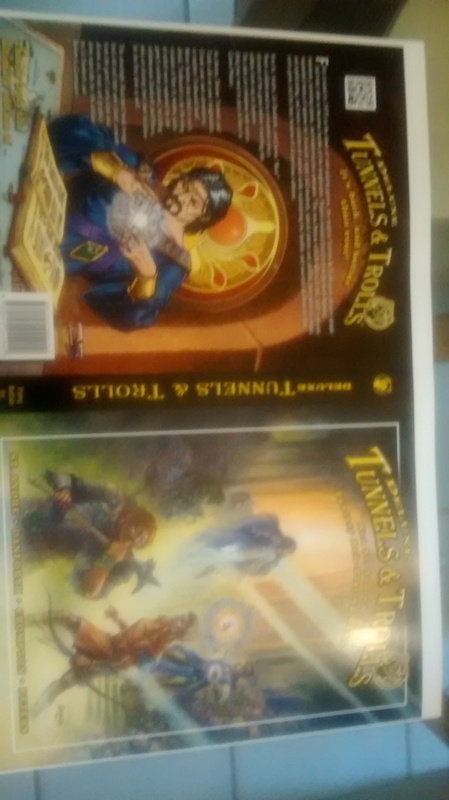 It may cost a little more to print the books here, but we want the world to know Tunnels and Trolls is an American product. This picture shows the major error that we found, and I’m the one who spotted it first. The spine, as planned, is not wide enough to hold all the pages in the book. It actually needs to be about half an inch wider to accommodate our contents. Steve measured the thickness of all the pages and compared it to the width of the spine. He will have to get back on his computer and redo the spine to make it wide enough for the book. 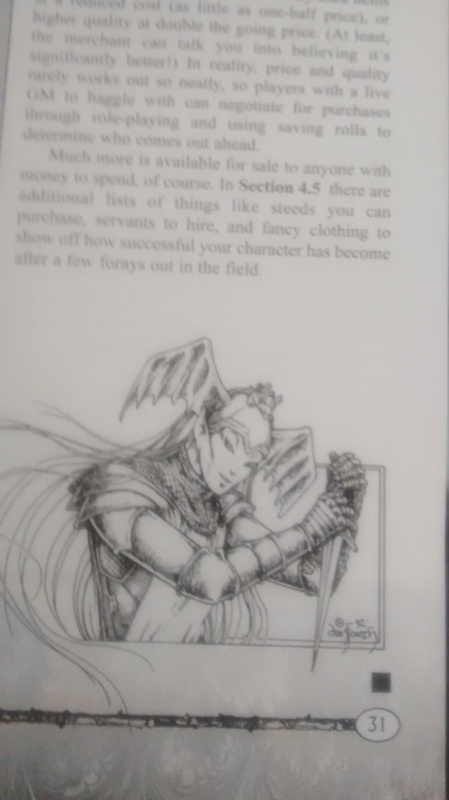 This should be a treat for fans of Liz Danforth’s art, a forgotten illustration from 1992 rescued and inserted into the rules. I want to set the record straight here. Tunnels and Trolls is my game (and your game, too, players). None of this happens without me getting things started, stirring things up, running Trollhalla.com for over a decade, and gathering an amazing team of friends to help me with all this. 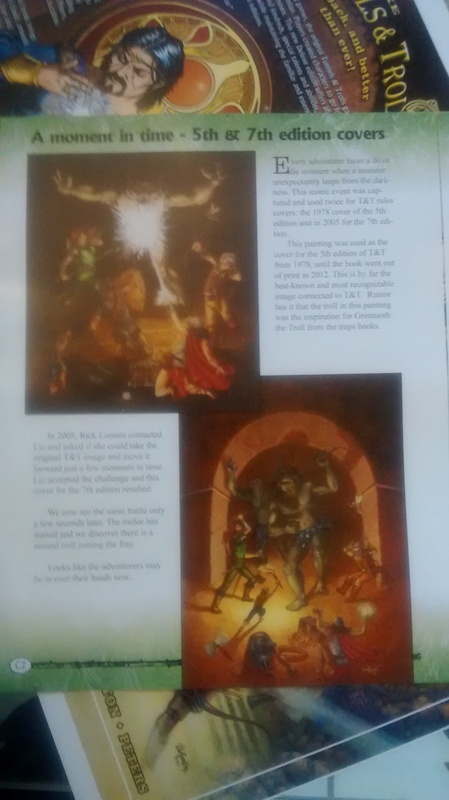 I’m the one who first got Liz Danforth to do some illos for Tunnels and Trolls. 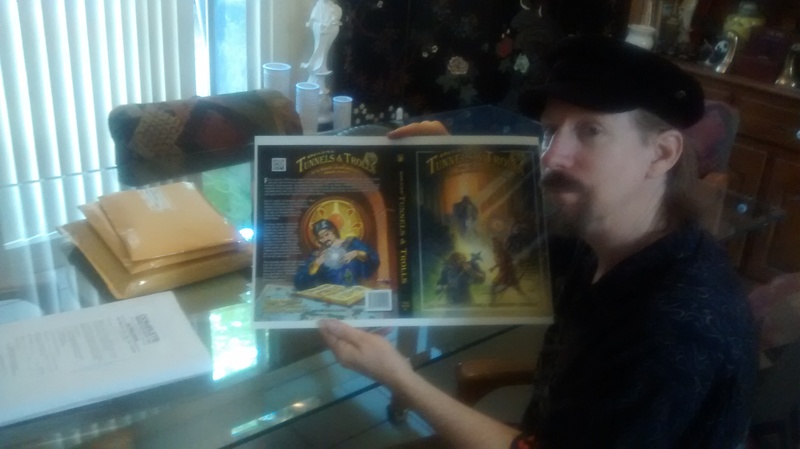 I’m the one who brought Steve in on some T & T projects back in 2012 that resulted in us deciding to do a deluxe edition. I’m the one who thought up the saving roll system, the character attributes and layout, the use of talents, the numbers for the weapons and armor, the monster rating system. I did all that. But this man, Steven S. Crompton, is the one who made the project happen. He’s the one with the master plan for the work. He’s the one who kept us on target over the course of more than two years. He’s the one who fixed the details, set the type, chose and approved the illustrations, dealt with printers and artists, created title pages, quietly fixed the small errors that popped up. Steve is the indispensable man for Deluxe Tunnels and Trolls. If I got it started, Steve made damn sure it got finished. He is still working on that–making things come out right for fans and players, authors and publishers. I don’t mean to downplay the prodigious efforts of editor/author/artist Liz Danforth. She worked harder and suffered more than any human being should ever to have to work on a book projects. 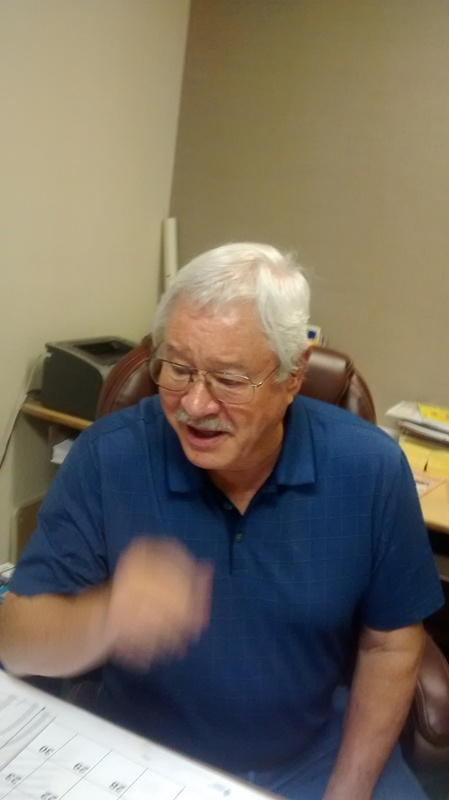 Publisher Rick Loomis provided the business acumen that makes the project possible. My friend, James “Bear” Peters added color and interest and help with the weapons. It truly was a Fellowship for us. Without the five of us working together, Deluxe Tunnels and Trolls simply would not happen. But, Steven S. Crompton, is the key figure in this project. If any of the others in the fellowship had dropped dead, they could have been replaced. Nobody could replace Steve’s contributions and dedication. (Side note: Steve has frequently been the magic that made Flying Buffalo publishing projects happen–he’s the one that finally finished Ace of Aces for FBI last year, and he’s the main artistic force behind the 50th Anniversary Nuclear War project currently in the works.) Steve is a gifted storyteller and artist in his own right, but I’m not going to talk about his stuff here. I just want the world to know that he is the go-to man for Deluxe, and a great friend/ally/asset to have when push comes to crunch and you have to get something finished. This shows how thick Deluxe Tunnels and Trolls is really going to be. Deluxe will combine the best features of the classic 5th edition and my 21st century update of the 7th edition. 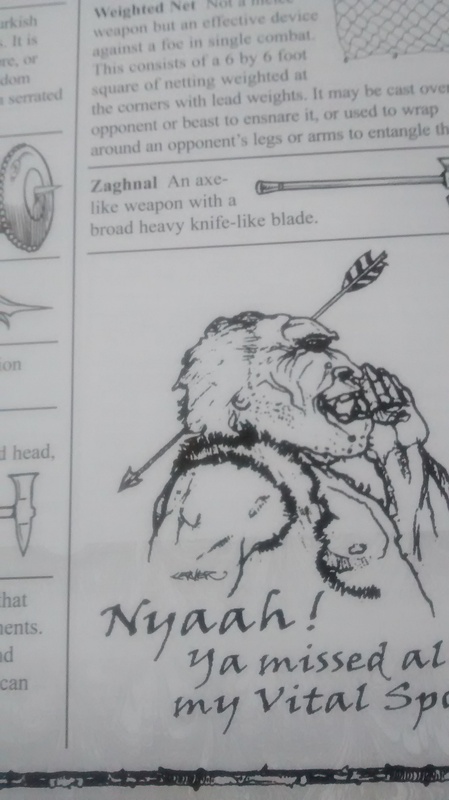 And here you have at the end of the book one of the oldest existing jokes in fantasy role-playing gaming, the original illustration by Rob Carver, the first T & T artist, who did the “missed all my vital spots” cartoon showing a troll with an arrow through his head. This joke dates back to 1975 when T & T was first produced. I was running an adventure for Rob and Bear and some other friends one night, when a giant cave lion attacked the party. As it leaped into them Rob’s character shot it with a heavy arbalest and did 40 points of damage to it. But the cave lion had a monster rating of 100. It did not die. It attacked and mauled the party severely before they finished it off. Rob was upset. “I shoulda killed it before it ever touched us,” he argued. “You missed all its vital spots,” I answered. The next day Rob presented me with this cartoon. So, I’m fairly satisfied with the day. 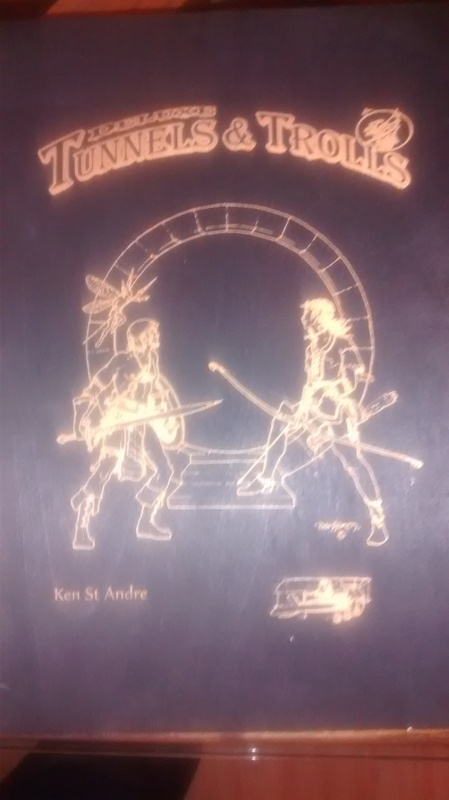 I think it was a morning well spent, and you can see, dear reader, what actually goes on in the production of those game books you like so much. If you’ve ever helped with the production of a book, why not leave a comment? 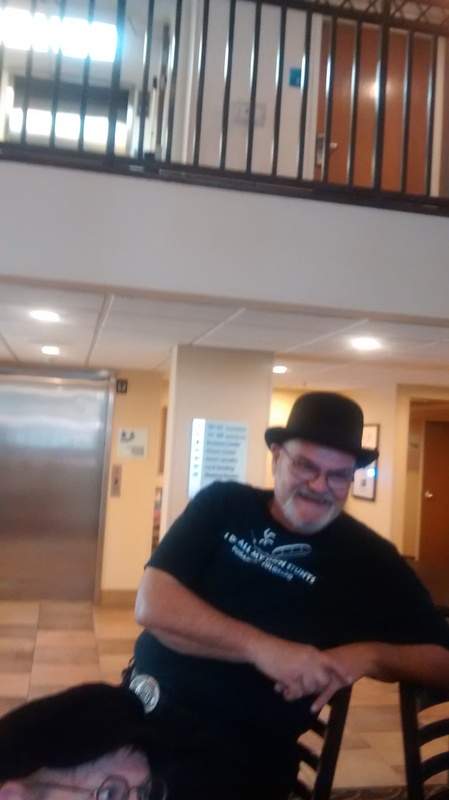 About noon on July 13, 2015, my layout artist, Steve Crompton (creator of Demi the Demoness) arrived to pick me up and take me with him when we visited the printer and the binder for Deluxe Tunnels and Trolls. Exact details needed to be worked out. As author of the book, I went along just to observe. 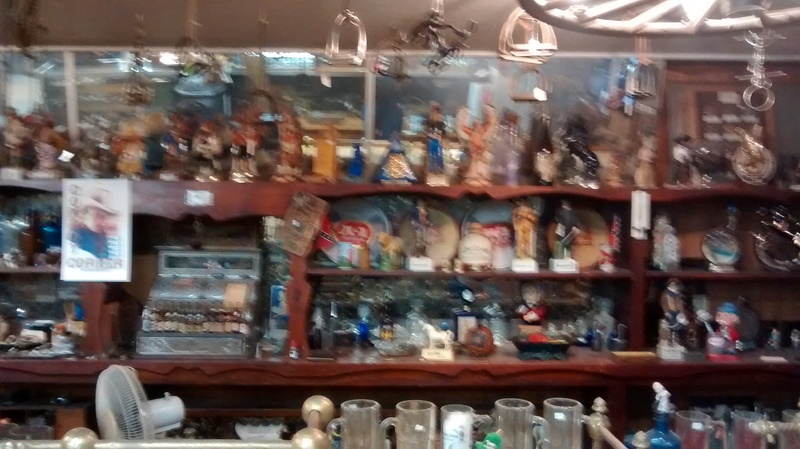 I took pictures, and served as navigator, because it’s my side of town, and I knew where these places are. 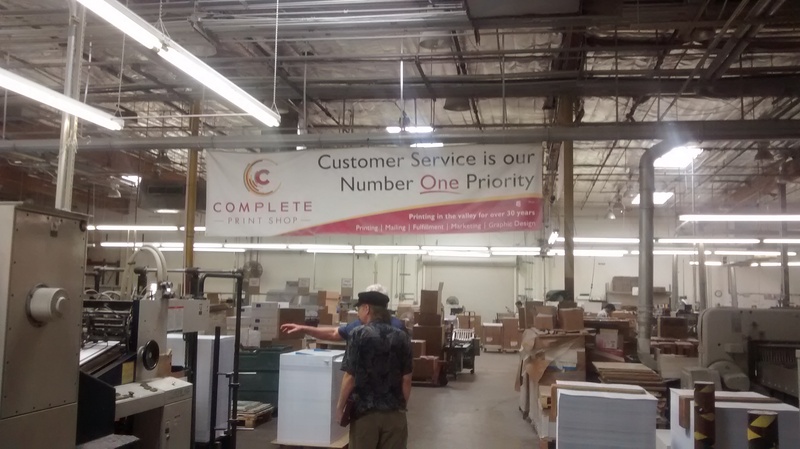 The tour started when we met with Dennis Dunn, who seems to be the boss at Complete Print Shop, located at 3433 W. Earll Drive in Phoenix, Arizona. 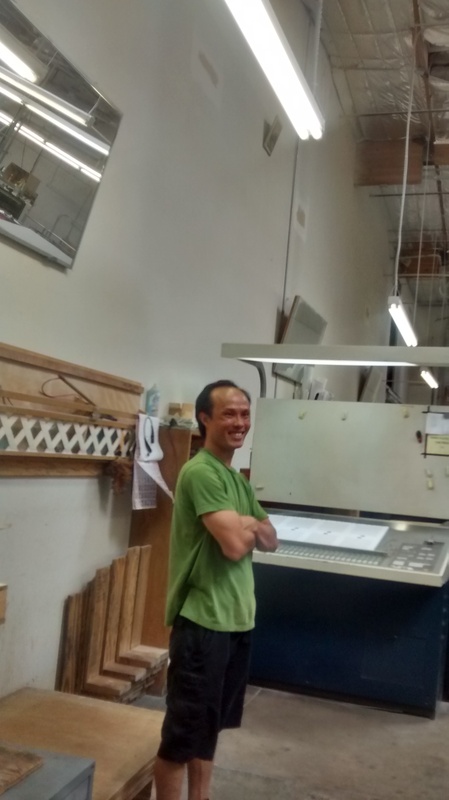 This is a large print shop and does most of the production work for my publisher, Flying Buffalo, Inc. Dennis not only helped Steve work out the details of getting the job done, but also gave us a tour of the printing plant. Mr. Dunn explains how things work to us. 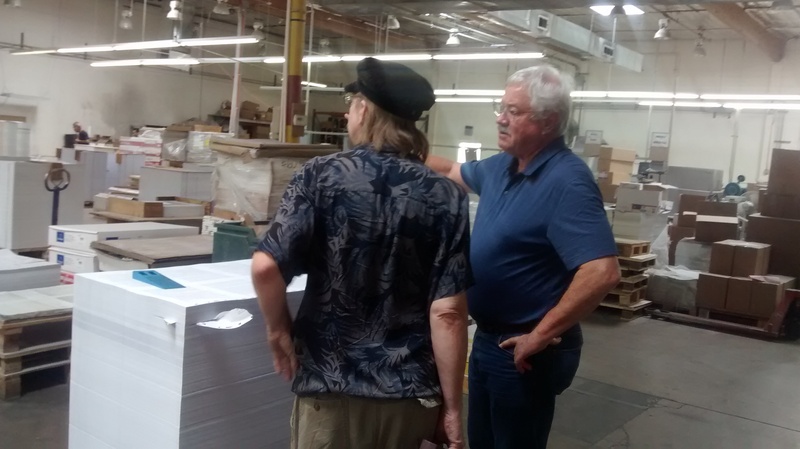 Steve Crompton is the man in the blue flowered shirt, and he’s explaining things like book size, and paper weight, and the number to be printed. I just stood back and observed. 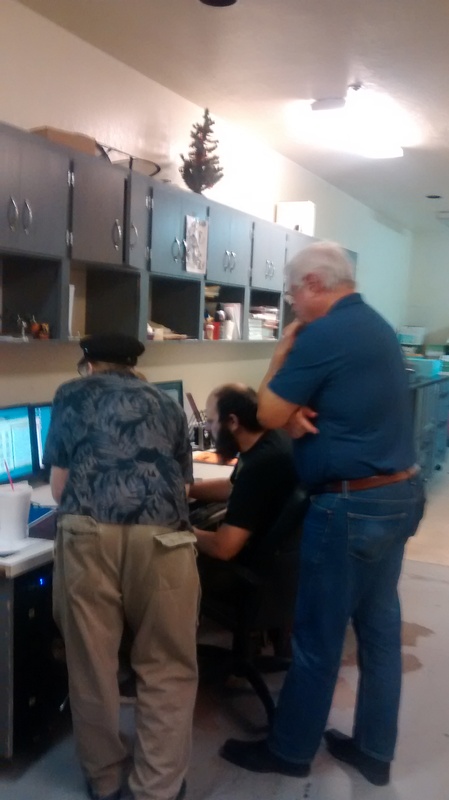 The guy at the computer is apparently the master printer for the plant, but I didn’t catch his name. This is a big printing job. 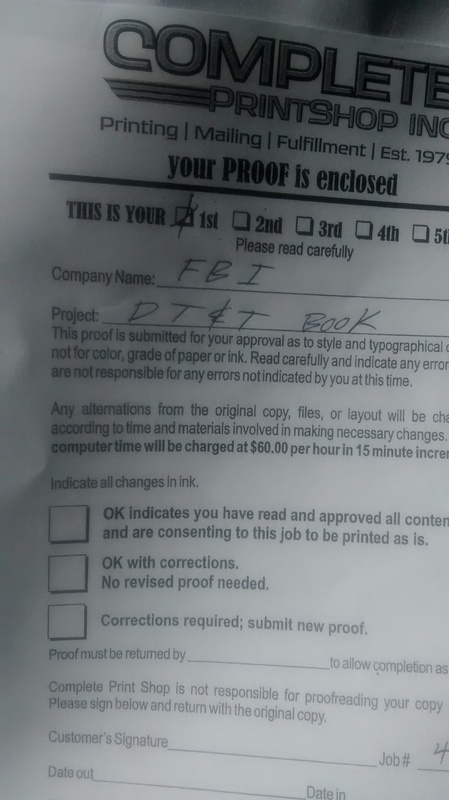 They will make master copies of 16 pages at a time on giant signature sheets that look like this. My book will be 368 pages long plus covers and end pages. 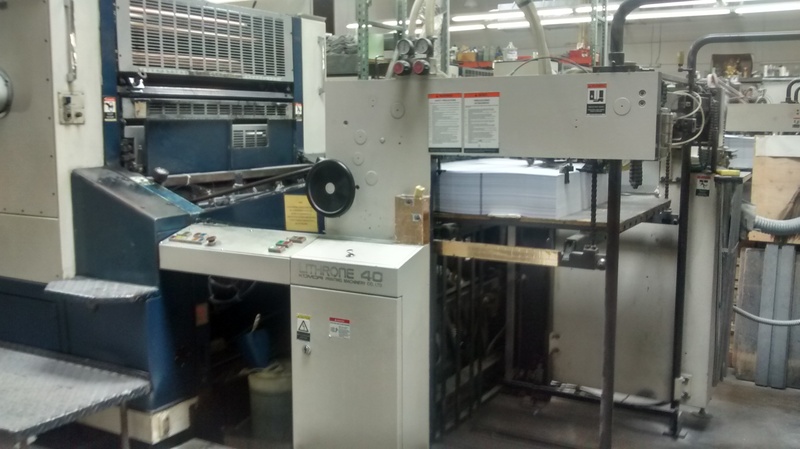 This is the biggest press machine in the plant, and probably the one they will print my book on. It was hard ar work when I took this shot. A workman always watches the press to make certain that nothing goes wrong while it is working. 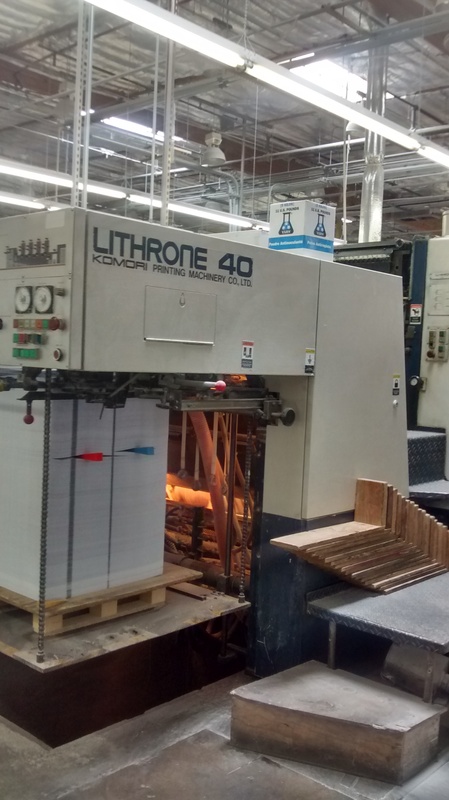 The press is moving at high speed, and printing and stacking huge sheets of paper faster than the eye can follow. This will give some idea of the scale of the room where the real work of printing gets done. When we see our books and newspapers, we really have no idea of how they are made. In this place mechanical magic is worked every day. Steve and Dennis did all the talking and planning here. 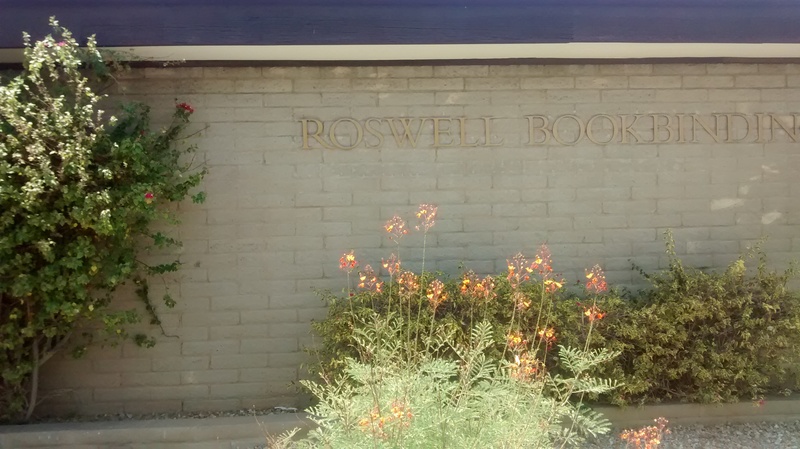 When we finished at the print shop, we drove over to Roswell Bindery, about a mile away. 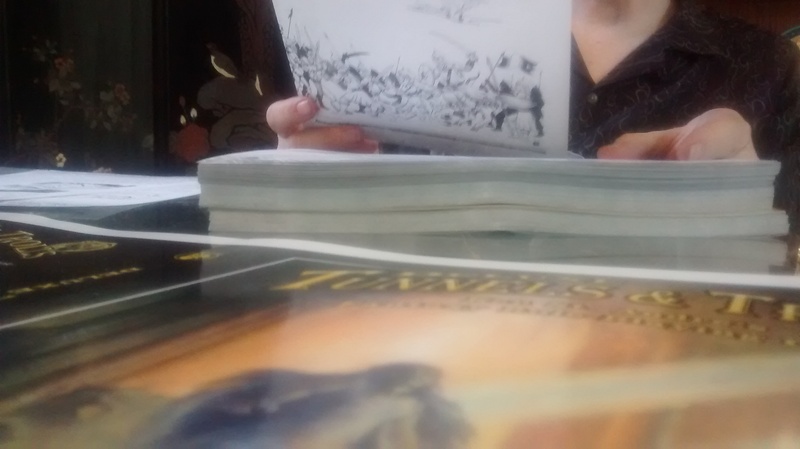 Paperback books are all done at the print shop, but when you want to produce a hardback, and we want 900 hardbacks of Deluxe Tunnels and Trolls, you have to make separate arrangements to have those books bound. We’re now at the front door of Roswell Bookbinding. The entrance is hidden just off to the left in this picture. A lot of Arizona businesses do like to beautify the front of the shop with trees and flowers. Roswell has a big front office. I’m not sure why it needs to be so large. Maybe it’s just to provide them with wall space to hang all their awards. We had an appointment with a manager named Nancy. 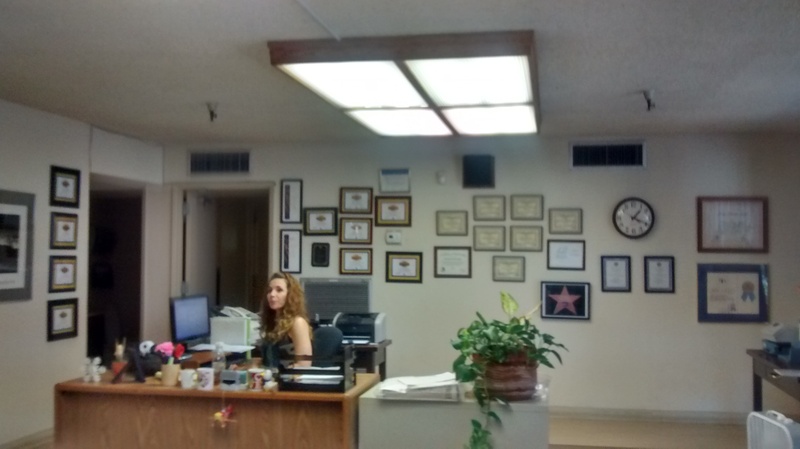 I did not get her last name, and she’s not this secretary/receptionist at the desk. 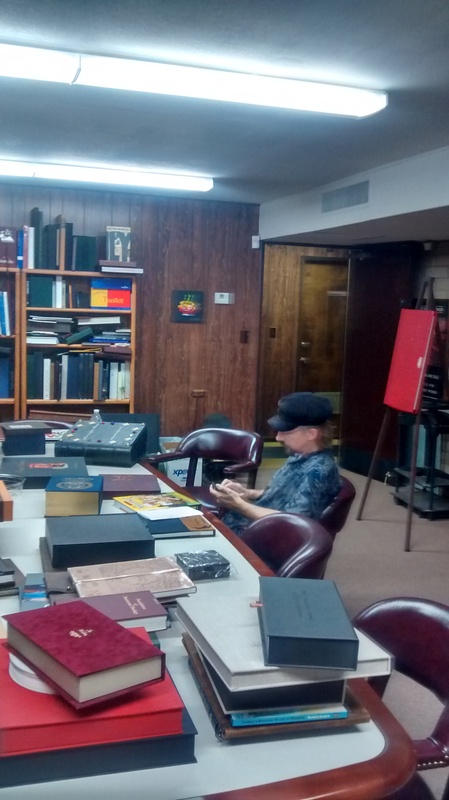 This woman took us back to a big conference room lliterally crammed with hundreds of examples of work the bindery has done in the past. Heh! My box is a bit rougher than the beauty that Roswell has. This is the book that was actually inside their box. Fancy! 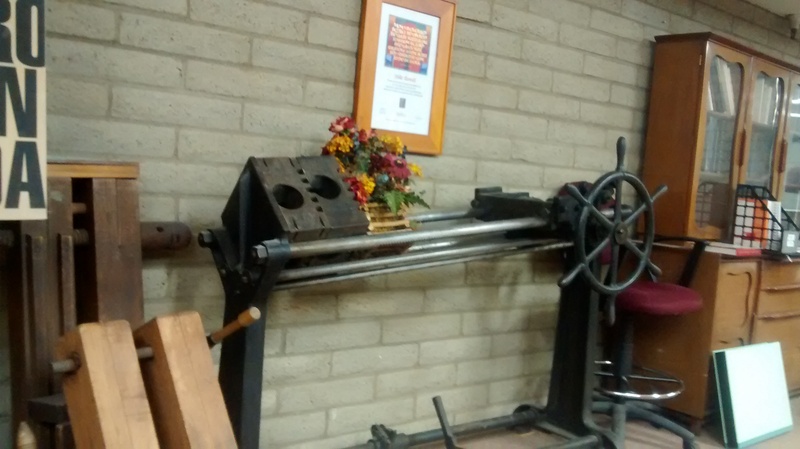 Antique bookbinding machinery stored in the conference room . . . Somebody must know what this stuff was used for, but I have no clue. Here’s my mad genius production manager Steve Crompton. 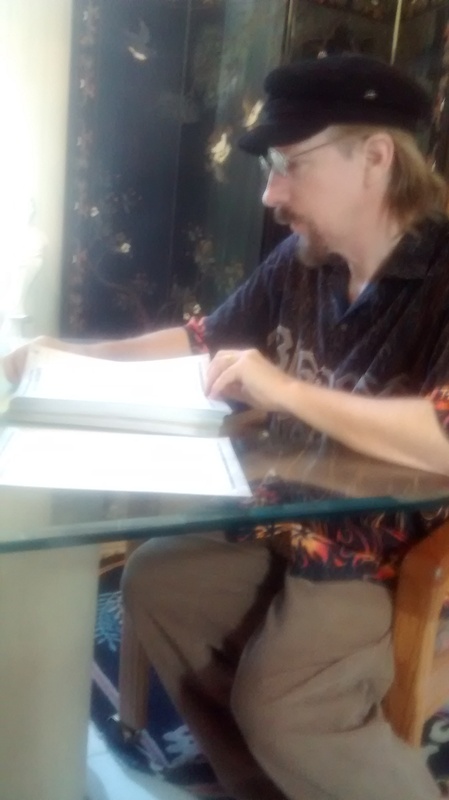 The yellow book in front of him is an underground comix price guide that he put together for another publisher. He told me it took nearly four years to do that one. 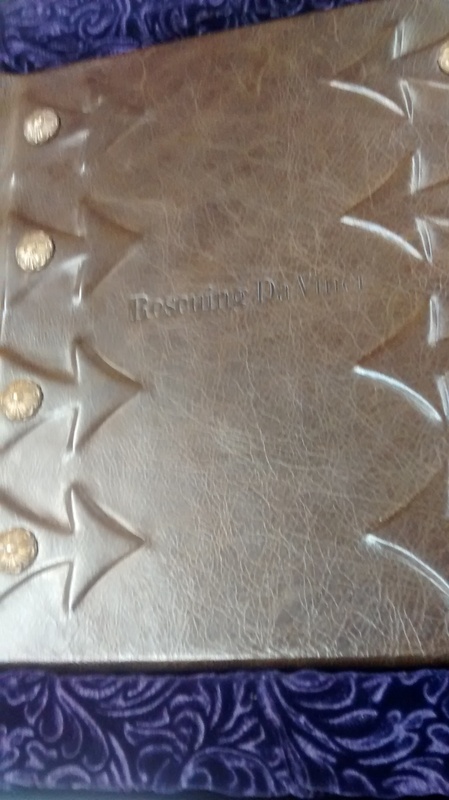 We also wanted to talk about slipcases for the hardback editions of Deluxe, so he brought an example. All together we talked about binding materials, gold stamping, a ribbon book mark, end pages, and coloring the edges of the book pages so they’re not just white. We may not do all of that, but we examined all the options. Took about an hour. I chose the color and style of the hardback skins and stamping. It will be a rich gold on a scaly black leatherette surface. Sweet! 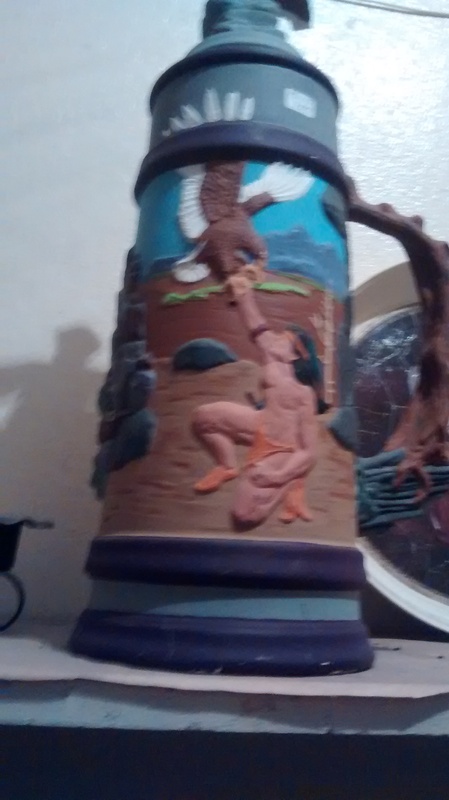 In another month or so, I will have a finished product to show. 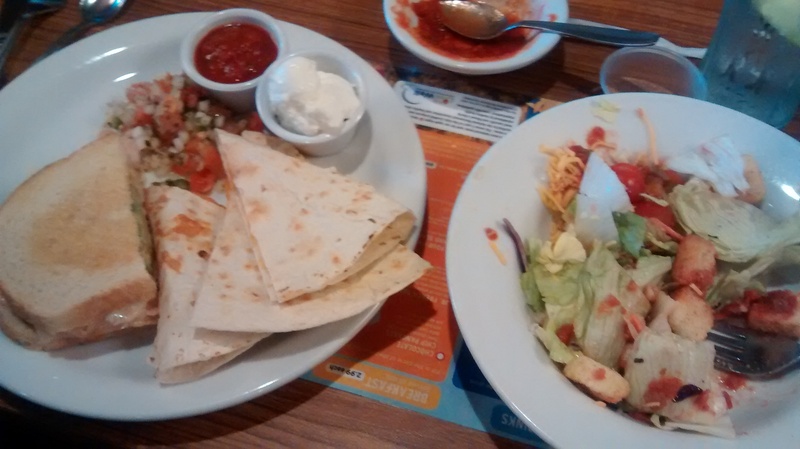 After about two hours of technical book planning, Steve and I went to lunch. I had this delicious salad. He had a burger. Yum. 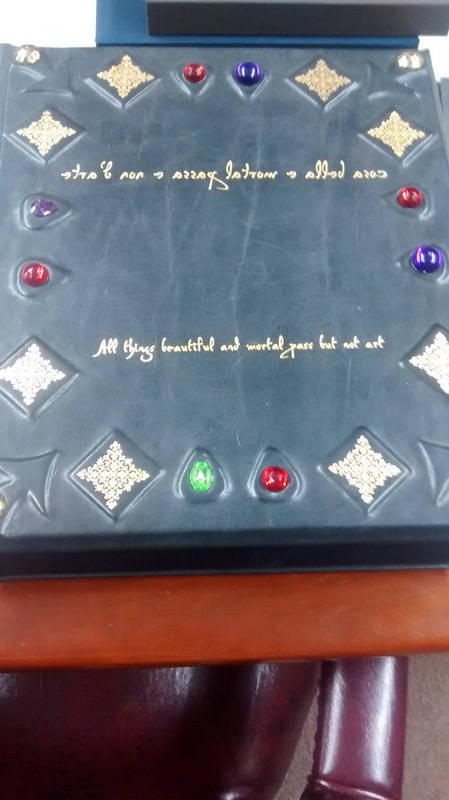 If you’ve ever arranged to have a book printed or bound, why not leave a comment? 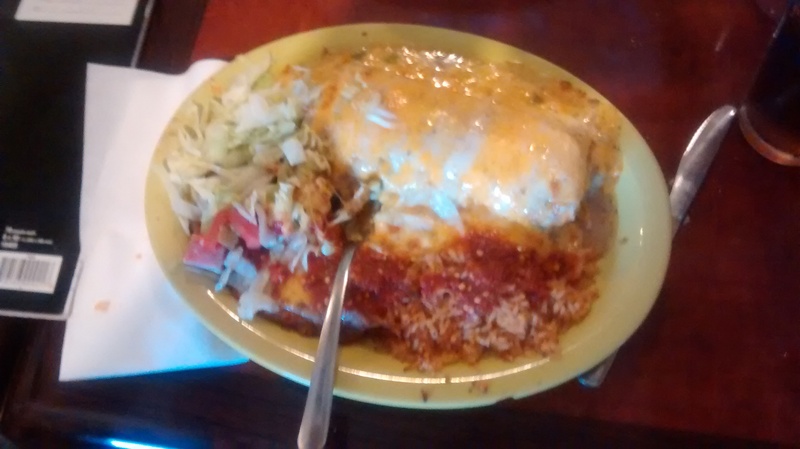 On Thursday, July 9, 2015, I set off to explore the town of Camp Verde and to drive over the Mogollon Rim. 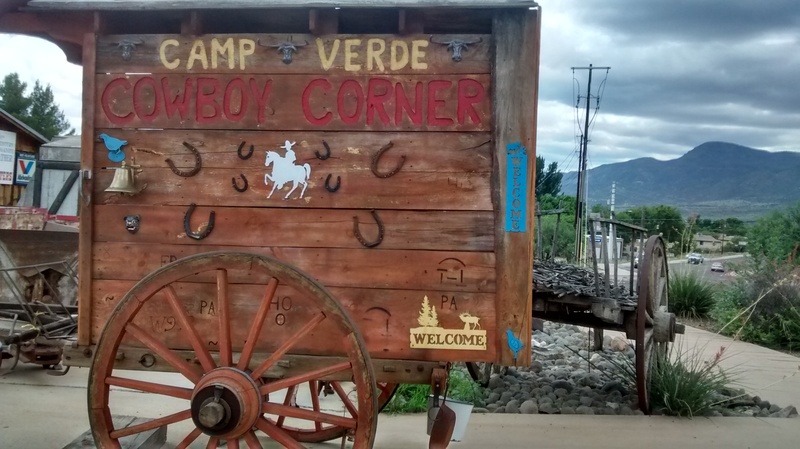 Camp Verde isn’t very large as towns go, but it had 4 distinct places of interest in it. 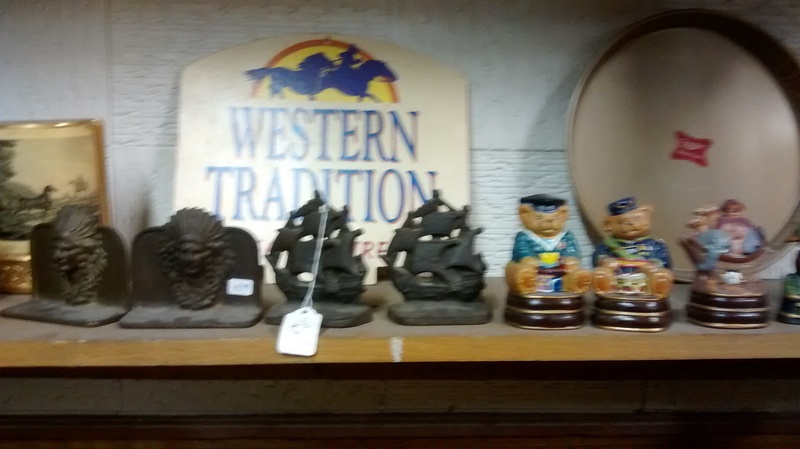 The place that generated the most interest was a combinatin antiques and cowboy supply store is called Cowboy Corner. Main Street in Camp Verde is about half a mile long. 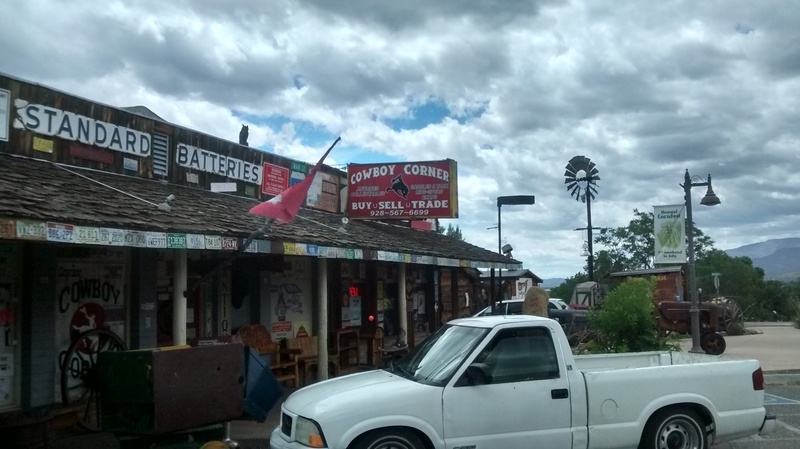 Cowboy Corner is at the south end of town. This is Amy. 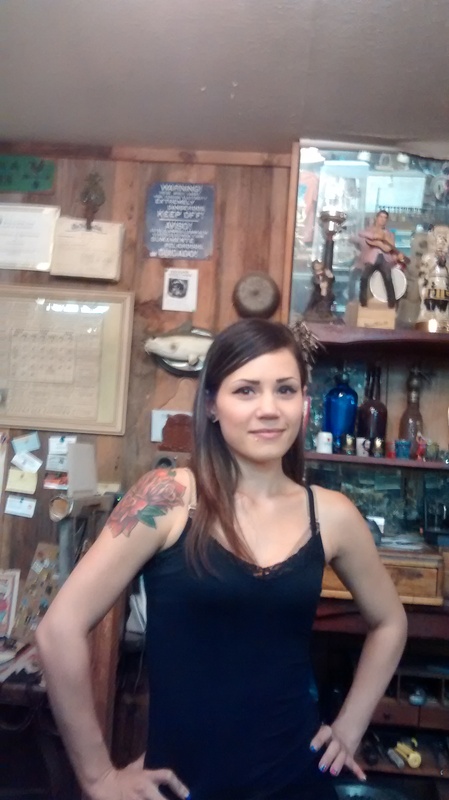 She worked the cash register in Cowboy Corner, answered my questions, and told me quite a lot about Camp Verde. I greatly enjoyed talking to her. Here’s the front of the store. 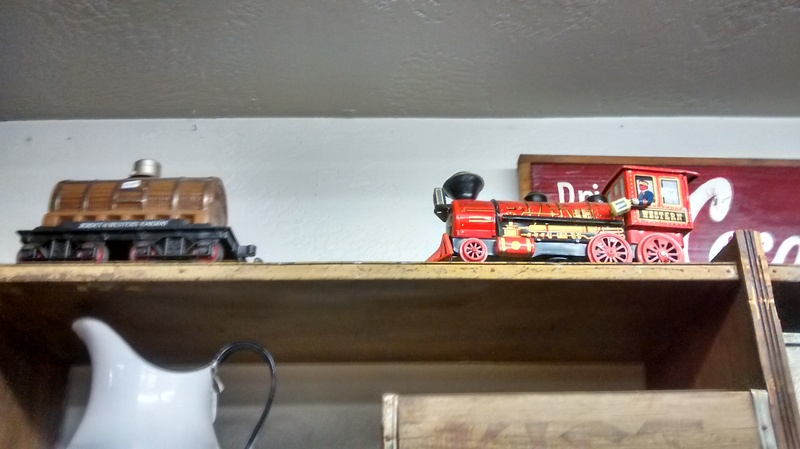 This old cart also served as a sign for the store. 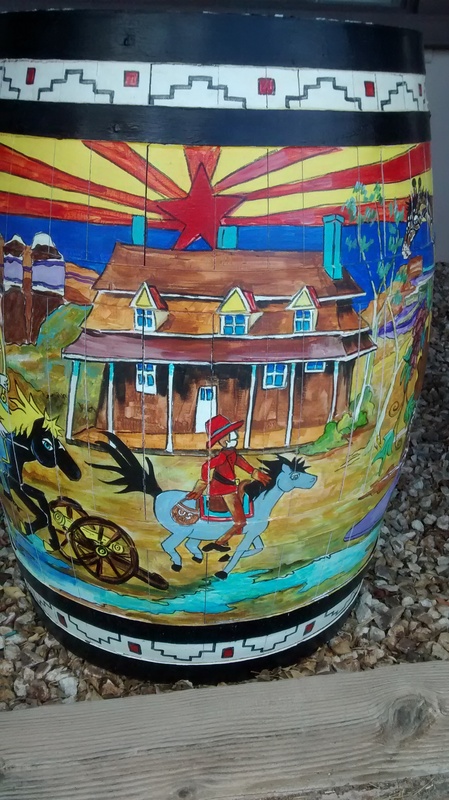 This brightly colored rain barrell sat on the sidewalk outside . . .
. . . as did this bucket full of gold. 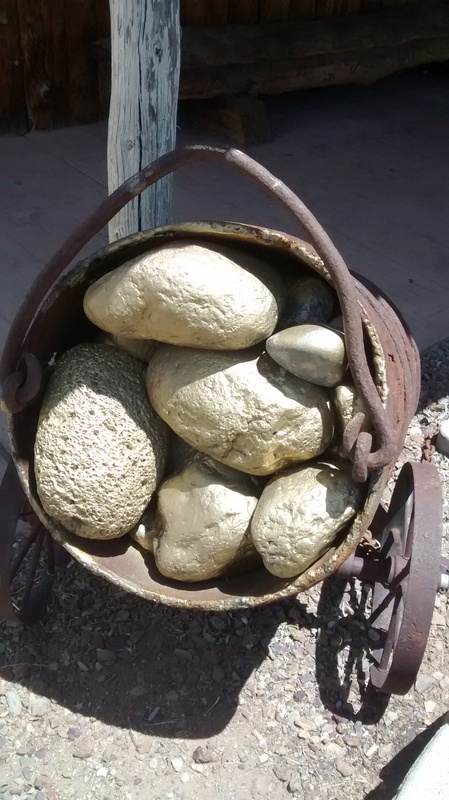 Gold is apparently so ordinary in Camp Verde that people just leave it sitting around in the open. 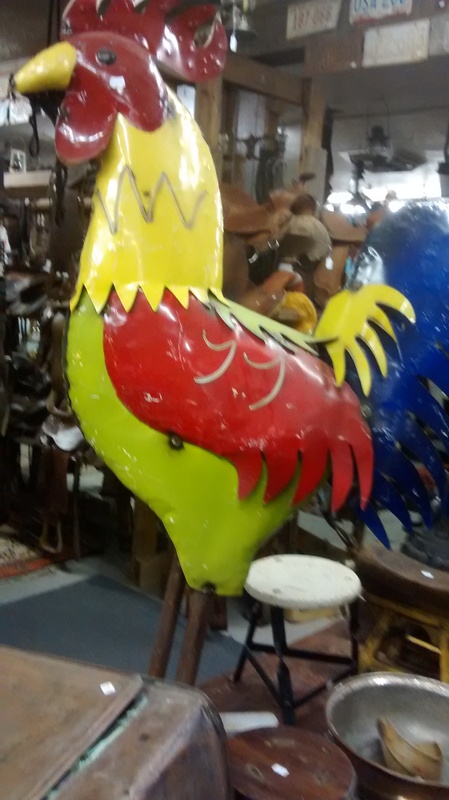 Inside the store was full of all kinds of fascinating and colorful stuff. I walked around and admired it all, and took pictures of what I liked the best. Here’s a bunch of it. Doesn’t really need any commentary. 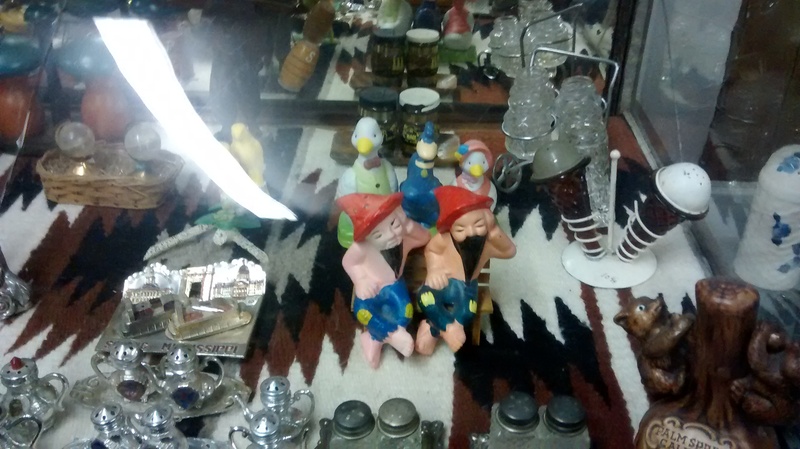 I really only took pictures of the antiques, and only the best of that. In addition there were more saddles than I’d ever seen in one place before, and quite a lot of belts, including cartridge belts, also bridles, bits, spurs, rope, and other things a cowboy might find useful. 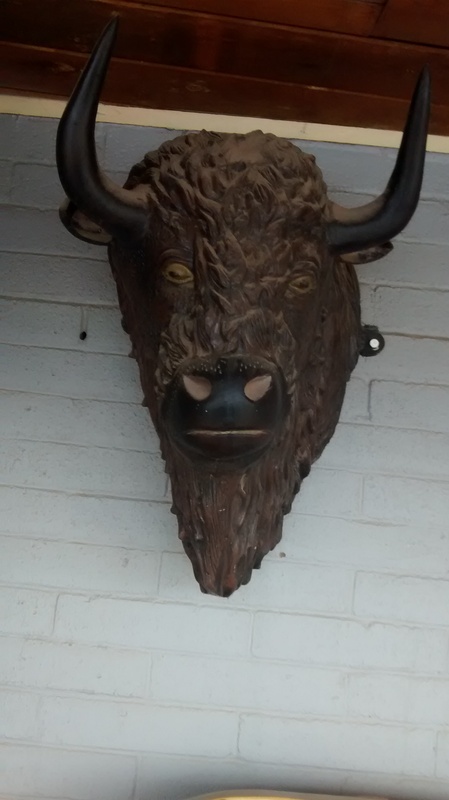 And there were wall-mounted trophies, The buffalo head was the best of them, but if you like taxidermy, and wanted a head or two for the study or the bunkhouse, including some that were just skulls, this would be the place to get them. 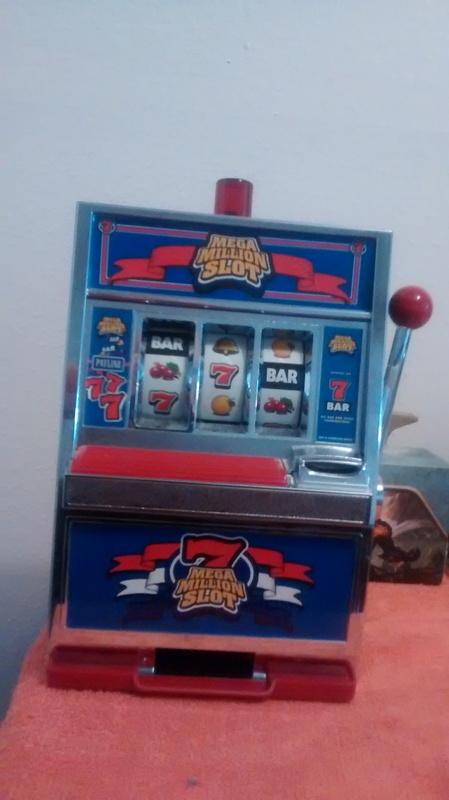 I did wind up buying two things, a heavy-duty bottle opener, no big deal, and a one-armed bandit slot machine bank. The bank is a lot of fun and will give me an interesting place to drop my spare coins. It works, and it’s a hoot to watch the tumblers revolve. Who knows? It may even pay off some day. 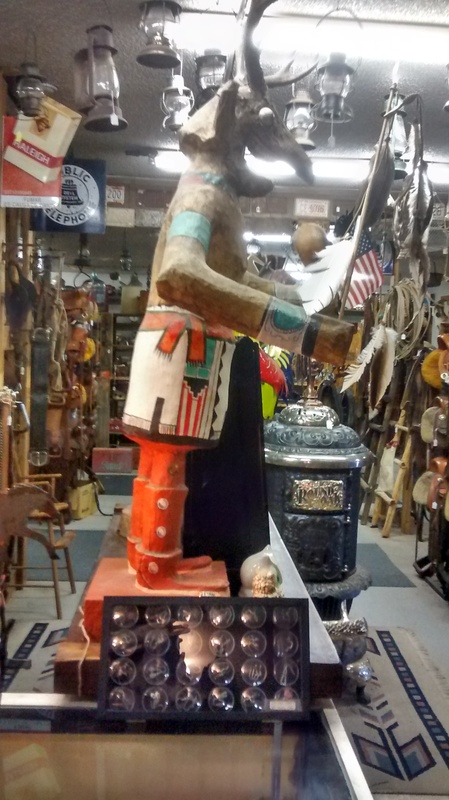 If you enjoy exploring antique stories in remote corners of your state, or if you own any slot machines of your own, why not leave a comment?